Troop Elections will be held on Tuesday, January 22, 2013, at regular troop meeting. Please think about the troop positions that you are interested in holding for the next six months. If you believe that a fellow Scout would be particularly well-suited for a particular position, talk to him about it, and then nominate him at the election. Remember, this is your chance to help shape and form the direction of YOUR troop! We will have a workshop for the Communications Merit Badge at the next troop meeting. 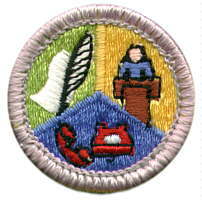 The Communication Merit Badge is one of 13 (soon to be 14) merit badges required for Eagle. Be sure to print out and complete as much of the Communications Merit Badge Workbook available from www.meritbadge.org, and bring it to troop meeting. Each Scout will also need to print and bring a Merit Badge Application, available from the Troop 501 Website (Fillable Microsoft Word File), or the Troop 501 Advancement System (online). By Bryan Wendell, an Eagle Scout, senior editor of Scouting magazine, and author of the Bryan on Scouting Blog at http://blog.scoutingmagazine.org/. Beginning Jan. 1, 2014, this badge will get a silver border. Moms and dads, prepare the needle and thread! Why the change? The goal is to “reflect a better balance of the needs of youth and our nation today and in the future,” according to the BSA’s resolution. Personally, I like it. Keeping up with the ever-changing world means questioning the way things have always been done. Sustainability becomes more important as our population increases while resources decrease. And a boy who reaches Eagle without skills in cooking and healthy eating habits hasn’t become fully “Prepared. For Life.” in my opinion. I think the BSA’s board got it right on here. For the list of Eagle-required merit badges as it looks now — and as it will look in 2014 — follow the jump.